It is easy to fall into a rut when it comes to our diets. I submit that January 2017 is a great time to shake it up a bit. My husband and I actually prefer to start our days with a savory breakfast, and we have both found that the combination of protein and complex carbohydrates keeps us satisfied longer… My blog has featured a couple of our favorites including Savory Waffles With Green Chile and Sausage Gravy and Green Chile Polenta With Runny Baked Egg. You may notice a common thread with these breakfast recipes? Yep. It’s green chile. Breakfast. Perfection. I have made savory dishes for breakfast with polenta (cornmeal), waffles, even buckwheat as in my Green Chile Buckwheat Polenta. Do not be too timid about your actions. 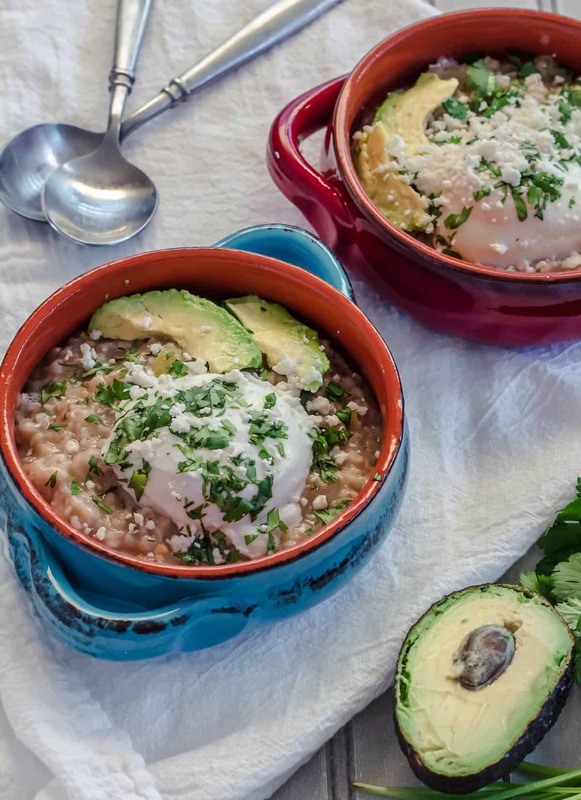 Green Chile Savory Oatmeal With An Egg couldn’t be more simple. You can use your preferred oats – steel cut, old fashioned or rolled, instant or quick. I prefer old fashioned oats for this recipe. They hold their shape and cook in 5 minutes. Quick oats do not maintain their texture, and the result is somewhat mushy. I love the firm texture of steel cut oats, but they can require 30 minutes to an hour to cook. The nutritional value is the same for all varieties. This recipe is flexible; use vegetable or chicken stock/broth as it adds flavor to the oatmeal. Check the package instructions for ratio of liquid to oats. Whatever you do, don’t forget the salt! Unseasoned oats taste flat. Hatch green chile is very widely available now. If you’re fortunate enough to have access to fresh Hatch green chile (as I did for 22 years in Las Cruces, New Mexico), then by all means, use fresh. You may find Hatch green chile in your grocer’s freezer section in tubs or plastic shrink wrap. 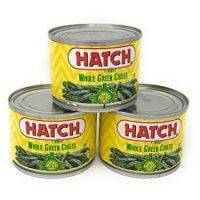 Another nice alternative is “canned” Hatch green chile that comes in jars packed only in water. Green chile can be found in mild, medium, hot, extra hot… If all else fails, you should be able to find canned green chile of some sort (it may not be Hatch) in the Mexican food section in cans. Remember, while oatmeal is naturally “gluten free,” if you have gluten sensitivity, be sure to check the package! Prepare your egg the way you like it. I have done this with both basted and poached runny eggs. Delicious! I make the recipe for 4 servings, and spoon half the oatmeal into individual ramekins for my husband to add an egg and “bake” it in our convection/microwave for his quick, early-morning breakfast on-the-go. If you’d like to dress it up a bit, try adding avocado slices, chopped cilantro, and crumbled cotija cheese. Come on… what are you waiting for? 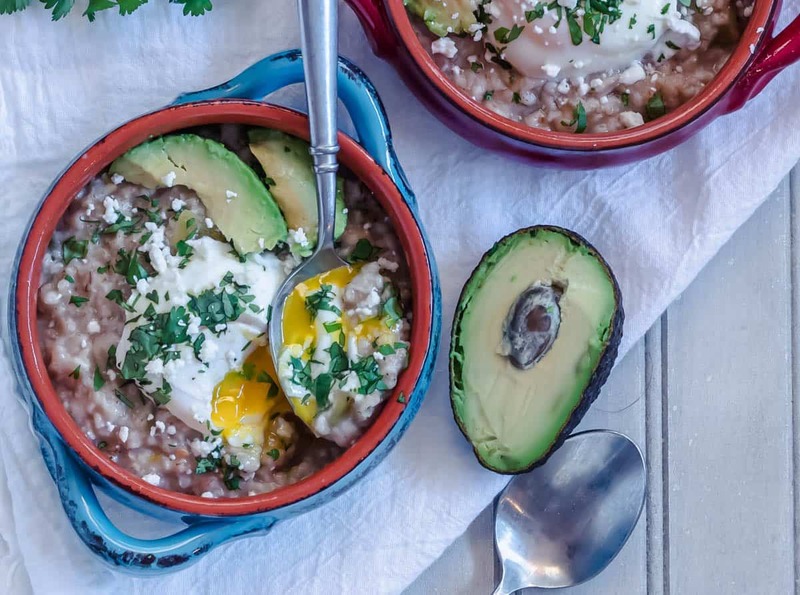 Does the sound of Green Chile Savory Oatmeal With An Egg prompt intrigue, mouth-watering, or repulsion? Haha 😆 Inquiring minds want to know! The start of a new year is a great time to add a bit of spice to your life in the form of a healthy and nutritious breakfast. Add the broth or stock and salt to a medium saucepan. When it comes to a boil, add the oats and chopped green chile. Stir to combine, and reduce heat to a simmer. Cover. Cook 5 minutes (or according to package instructions), stirring once or twice. Prepare one egg per person according to your preferred method. To serve, add the green chile and oatmeal to a bowl, top with the egg, and garnish as desired. My instructions are for "old fashioned" or "rolled oats." Confirm liquid to oats ratios and cooking time, and adjust accordingly. You can use fresh roasted, frozen roasted, canned in a jar roasted, or canned in a can roast green chile. Drain excess liquid prior to adding. This dish is awesome with sliced avocado, chopped cilantro, and crumbled cotija, but it's still delicious with just the oatmeal and an egg. Be sure to season both the oatmeal and the eggs! I love poached eggs, but don't always want to bother with them. Basted is my second choice. Oatmeal is inherently "gluten free." However, if you are gluten sensitive, check for certification! I make this recipe for 4 for the 2 of us. I place the remaining oatmeal into stoneware bowls and cover with plastic wrap. They can be reheated and topped with a fresh egg for breakfast on the go! This super easy and quick breakfast is healthy, and a "go to" breakfast at our house! I'm with you hon! I have this more often than anything else for breakfast... until I run out of Hatch green chile! *boom* that is my head exploding ;) I don't know why I haven't ever considered savory oatmeal. It sounds phenomenal. I also love the chile + egg combo. I know, right? I really prefer a savory breakfast to a sweet one, and oatmeal is so healthy. I'm so excited to have found a way to combine them in a quick breakfast! I have to try this some time! That avocado is calling my name! Everything is better with avocado, right? It can't hurt to try Raia! Maybe leave out the chile in theirs? It's a great way to start the day! What a great idea! I love savory quinoa so why not oatmeal? I mean really everything's better with some spice and a warm egg. Looks delicious! Thanks Karen! I've been mulling the idea around in my head for quite some time, and I am so pleased with the results! You totally sucked me in with the Green chile! I have a Hatch Chile Pork Empanada on my blog today -- those chiles make everything better -- and i love the idea of savory for breakfast -- that egg is the cherry on top! Yay for Hatch green chile fans! Your empanada sounds fantastic, so I'd better check it out. :-) This savory oatmeal is a super quick and healthy way to start the day! I am BEYOND ready to try savory oatmeal. Filing this baby for my post-whole30 life! Yummo. Yay for savory oatmeal Christine! I hope you like it, and good luck with whole 30! This just looks soooooo good! The perfect way to warm up my belly on these freezing mornings! And that egg on top is just the cherry on top! I love the idea of a savory oatmeal! 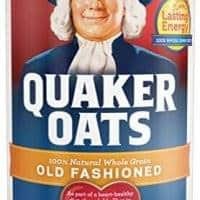 I never grew up on oatmeal like my hubby did. Eats it all the time. I grew up on pasta so I would eat pasta for breakfast all the time. I think that having a savory breakfast far outdoes any sweet offering. Don't get me wrong I love my doughnuts but I prefer a bagel with cream cheese and chives (nothing sweet) or some polenta. I usually make mine with broth instead of water to make it more savory. A friend of mine in college used to eat milk and sugar on her rice (she was a Northerner...) which I used to think was weird but a grain is a grain. Oatmeal, polenta, rice, quinoa, whatever. Having savory, and spicy for that matter, is on point! I don't get Hatch chilies here but thanks to the interweb I will be getting some soon! 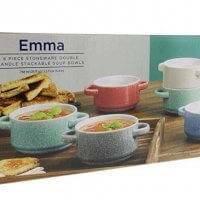 This sounds delicious especially on these cold mornings. 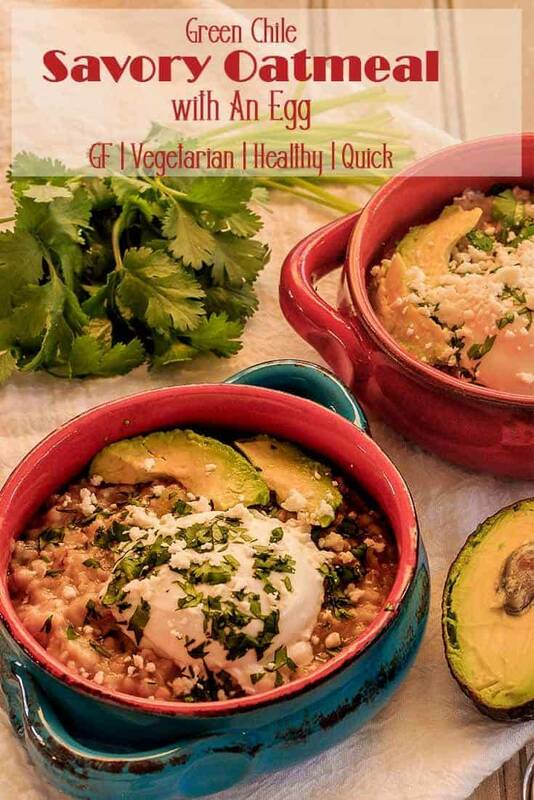 I love oatmeal and the idea of adding green chili's and egg sound amazing!